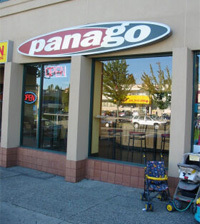 Panago has built a reputation as Canada’s premier delivery and takeout pizza franchise. Panago’s fresh approach has allowed us to connect to consumers with a powerful and distinct market position. Our chef-created original pizzas, fresh salads, breadsticks and wings have proven to be the perfect response to today’s evolving consumer, satisfying their expanding culinary tastes, demand for quality convenience. With industry-leading innovations such as the largest deployment of wireless point-of-sale terminals in Canada, and the first to market with Pizza Dips and Shakers, Panago continues to change the face of the delivery takeout pizza market. Our spirit of innovation and operational style is flexible enough to shift, grow and evolve with our customers, creating a recipe for success that has made Panago a leader. Panago is about the business of creating the perfect pizza experience and building a brand based on insights into cultural shifts. Panago is the perfect response to today’s consumer demand for convenience, healthier eating and expanding culinary tastes. By offering consistently fresh, nutritious and convenient meals for people on the go, Panago has built a reputation as a premiere pizza franchise. By redefining the marketplace and establishing ourselves as a leader in every market we’ve entered, Panago has developed over 160 successful franchised locations across Western Canada, with 2002 system-wide sales in excess of $100 million. For us, pizza is not just about tossing a few ingredients on a dough base and baking it. Redefining the market starts in the kitchen with our expert chefs combining quality ingredients to create truly unique taste experiences. In other words, our pizzas are created, not just made. On top of that, our dips and shakers invite our customers to further personalize their favorite pizzas to their individual tastes. Our ability to offer healthier alternatives has given us another edge. We were first to introduce a selection of high-quality fresh salads and an all-vegetarian Yves Pepperoni Pizza. Same goes for our innovative use of new technology. Along with our call centre, one-number “310” Intelliroute dialing, and the largest deployment of wireless point-of-sale terminals in Canada, Panago continues to implement cutting edge technology and systems to satisfy our time-pressed customers. Panago Pizza is not just a product, it’s an experience. Our locations present themselves as evocative environments where every product is created individually before the customer’s eyes. It’s not just that people can see into our kitchens, it’s what they see that’s different. Our locations function efficiently, back to front, from delivery of ingredients, to the finished product presented to the customer. The centerpiece of every location is always the pizza arriving steaming hot, fresh from the oven. The element of theatre stimulates all the senses, not just the palate. Style is an increasingly important element in how people select brands, so understanding style as a communication channel is integral to Panago’s success. From our distinctive signage and contemporary European influenced interior design, right through to our unique pizza boxes and standout advertising, the sense of style in everything we do and say distinguishes us from everyone else in the marketplace. In every way, Panago is the brand for today with every element working together to form a holistic brand experience. Panago has always been an active part of the communities in which we serve. Our approach is all about involvement, focused on two main areas: literacy programs for children through local schools and libraries, and partnerships that support amateur sport at a grassroots level. Panago is the supporting spirit behind those who make a real difference in our neighbourhoods and that makes for great community relationships. Panago blends years of experience in finance, development, operations and marketing, combined with a proven history of managing Western Canada’s premiere pizza delivery/takeout franchise. It’s a recipe for success that is built on a foundation of training, support and a commitment to the success of your business. Everyone at Panago, from head office staff, franchisees, to every employee, provides a level of excellence that is our own unique standard. This degree of professionalism starts with a basic foundation: a rigorous six-week course covering all aspects of opening and operating a successful Panago franchise. additional operational and technical support. Every Panago franchise is given the tools and assistance needed to get the most out of their investment and build a successful franchise. Get a slice of the action. With a proven capacity to build equity for the franchisee over the long-term, Panago’s franchise system is built on solid training, leading support systems and backed by effective marketing and advertising. To learn more about the Panago pizza franchise opportunity, simply complete the form below.